Since the church seems to be made of lava stones I searched in La Reunion island.Can't find it. Nari, go back to where you were - perhaps I was too hasty in saying "no". I was influenced by geography, not politics. Yves, save your time as far as Comoros is concerned. Head back to La Reunion and sail around a bit. Quite a bit, maybe, if your boat is a small yacht. Well I had a little tour aboard my sailing boat. She dropped me at Saint Gabriel, Rodriges island where I arrived in time for the mass. It is remarkable the little things that sometimes set us on the right course on these puzzles, even if for the wrong reason! Ombugge thought he had discovered a Dutch influence in the building, which sent him off to South Africa for a start, and that set the scene for further explorations. My quibble about what you would call the building was that it is actually not just any old church, but the cathedral. And it is part of the Mauritius Republic although, according to Wiki, is an autonomous island. Where will you send us now? This last one was obviously cunning Ivy (in the good sense of the word,in French I'd say astucieux).Even by searching Mauritius, Saint Gabriel does not appear on google pictures (I tried in several languages). It was a nice trip.Thank you. Full steam ahead for a new one. No Ombugge.It's not La Reunion. First tell us which way you were facing, Yves. I don't know.I have not a good sense of direction! In an Overseas French Territory somewhere probably, but which one?? I try French Polynesia first as a fishing expedition. Not in Polynesia nor overseas French departements. Which could possibly mean France itself - or possibly not. "Possibly not" is the good option. No not New Zeland.But what you say about cars is true. I think this reminds me of Canda.... Quebec. Seeing the buildings, the first thing that came to my mind was Quebec. But then, New Zealand is pulling even though we have ruled it out. I go for Quebec, Canada! Absolutely.We are in the province of Quebec. But,of course it's not Quebec-town. C'est le musée régional de Rimouski. Il est située à Rimouski, dans la région du Bas-Saint-Laurent au Québec et dont la mission est la diffusion de l'art contemporain par le biais d'expositions, d'activités d'interprétation et d'animation. Le musée est aussi un lieu de diffusion en histoire et en sciences. 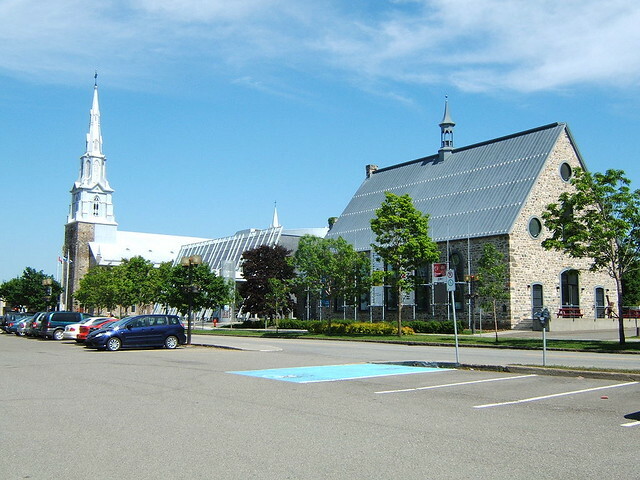 There are contemporary art exhibitions and regional projects, It is situated in the oldest church building of East Quebec. This ensemble was later a monastery and is since 1972 a museum. Jan-Olav and Ralf, you are brilliant! Spot on Ralf. Rimouski it is. I choose it because it is the departure harbour for a kind of “Canadian Hurtigruten” known as Relais Nordik. From Rimouski to Blanc Sablon this line serves the isolated villages of the North shore of river Saint Laurent and supplies a region mostly not connected to the road system. The roundtrip takes ten days aboard a brand new ship (Bella Desgagnés). A navigation I’d like to do, one day…. Jan-Olav had the bigger step with mentioning Quebec. Combining this with my keywords from the New Zealand search, it was a question of seconds. Such an interesting link! I did not know about Relais Nordik! I must have a long visit on their site, Thank you. Now the next one. Where is it and what is it for?